China's Communist Party will unveil its next generation of elite leaders when it meets starting on 18 October for a congress that is held every five years. Except for President Xi Jinping and Premier Li Keqiang, five of the seven members of the party's top body, the Politburo Standing Committee (PSC), are expected to retire later this year. Given the opaque nature of Chinese politics, it is tricky to say who will fill the vacancies - though it is certain that they will likely be those close to Mr Xi. 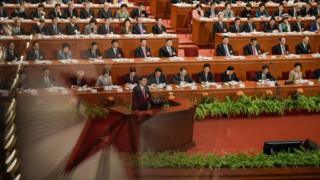 The BBC takes a look at the men widely expected to take over the reins of China's ruling party. Chen Min'er, 56, was appointed Chongqing municipality party chief on 15 July, replacing Sun Zhengcai who is being investigated for corruption. He spent his early political life working in his native Zhejiang province, where he developed close ties with Mr Xi while working under him from 2002 to 2007 in his tenure at the province's propaganda department. Describing him as Mr Xi's "trusted confidant", Hong Kong newspaper South China Morning Post noted that his promotion "cemented his credentials as a contender to join the upper echelon of the party" at the congress. Before becoming the head of Guangdong, an economically strong province in southern China, Hu Chunhua worked in Tibet, Hebei and Inner Mongolia in various capacities. He also became the first secretary of the Communist Youth League, the party's youth wing, in 2006. Mr Hu, 54, was elevated to the Politburo in 2012, becoming one of the youngest members of the 25-member grouping which ranks just below the PSC. Known as "little Hu", the Guangdong boss is reportedly backed by former Chinese leader, Hu Jintao. He is part of the so-called "sixth generation" of leaders born in the 1960s and, along with Chen Min'er, is regarded as a potential successor to Mr Xi, independent Hong Kong media report. Li Zhanshu is the director of the General Office of the Communist Party's Central Committee and, as the top presidential aide, handles Mr Xi's daily activities. The 67-year-old often accompanies Mr Xi on domestic and foreign tours, the latest being the Chinese leader's state visit to Russia in July. Mr Li is said to be a skilled administrator, having held regional posts in Hebei and Shaanxi province. He was elevated to the Politburo in 2012. He is also said to be Mr Xi's most powerful ally after anti-corruption chief Wang Qishan, and has been a close friend of the president since the early 1980s. Wang Huning is the Director of the Central Policy Research Office and, like Li Zhanshu, is part of Mr Xi's entourage during overseas visits. The 61-year-old former Fudan University scholar has extensive policymaking experience, having advised former presidents Jiang Zemin and Hu Jintao. Said to be Mr Xi's top foreign policy aide, he has been labelled "China's Kissinger" by South Korean daily The Hankyoreh. Independent Hong Kong daily Ming Pao says that Mr Wang has a good chance of joining the PSC as he is close to Xi, although it adds: "He is a low-key person and it is said that he is not interested in getting promoted." Wang Yang is currently one of four vice-premiers in the existing government and is a two-term Politburo member. The veteran politician was previously the party chief of Guangdong province from 2007 to 2012, and is a key figure behind Mr Xi's ambitious Belt and Road Initiative. Like Hu Chunhua, Mr Wang comes from the "Youth League faction" of the party, and is seen as one of the top contestants for a PSC seat, Hong Kong media note. There are also growing indications that Mr Wang could replace Li Keqiang as the premier, in what would be a break from the two-term tradition for China's top leaders. Mr Han is currently a member of the political bureau of the party's high-ranking Central Committee, and served as the mayor and deputy party secretary of Shanghai previously. Some believe he may replace Wang Qishan as the head of the powerful anti-corruption body the Central Commission for Discipline Inspection. If he is promoted, it would "prove that persistence pays off, with the 63-year-old not even counted among potential dark horses a decade ago when political analysts were compiling lists of rising political stars on the mainland", the South China Morning Post says. Shanghai has been the launch pad for several former leaders, including Mr Xi, who served as the city's party chief before joining the PSC in 2007. Liu He, director of China's Office of the Central Leading Group on Financial and Economic Affairs. All these men may be jostling for limited spaces - a number of media sources report that Mr Xi may cut down the size of the PSC from the current seven members to five.